With a long and venerable career representing clients in matters relating to infrastructure, natural gas and oil development, transportation and distribution, energy reliability, enforcement and compliance, and international energy policy, Ms. Hollis has received many honors and recognitions from the energy and legal industries. In 2018, she was honored as a “storied energy lawyer” with the Petroleum Economist’s Legacy Award, an award given to outstanding individuals for their industry contributions. In 2017, she was named by Super Lawyers as one of Washington D.C.’s Top 100 Lawyers overall and one of the Top 50 Women over several years. She is the first energy lawyer to be named to this list. In addition, Ms. Hollis was recognized by the American Bar Association (“ABA”) as a “Trailblazer,” an honor given to women in law who “changed society.” She was among only 100 women to be so honored for breaking barriers for women in cutting-edge areas of the law. Her personal story is now at the Library of Congress, Harvard Law and Stanford Law libraries. 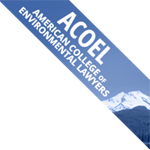 In 2012, Ms. Hollis was inducted as a Fellow into the American College of Environmental Lawyers, an honor bestowed upon a select group of lawyers with “distinguished experience and high standards.” Ms. Hollis was also named one of the “50 Key Women in Energy Worldwide” and received the 2011 Lifetime Achievement in Energy in Platt’s Global Energy Awards. She is the first attorney in private practice to receive the Platt’s Award. Ms. Hollis has also been ranked by The National Law Journal as one of the United States’ top 20 energy lawyers and has received the highest possible rating from Martindale-Hubbell’s Peer Review Ratings for over 30 years for professional excellence. Represent clients in multiple due diligence reviews—including regulatory, policy, CFIUS, and State compliance and jurisdictional assessments—for major investments in energy-related infrastructure in the U.S.
Broadhurst, Brook, Mangham and Hardy, Washington, D.C.
Butler & Binion, Washington, D.C.
Wilner & Scheiner, Washington, D.C.
Federal Power Commission, Washington, D.C.